A max of 12 (ISC)2 CPE credits are available for CISSP, CSSLP or SSCP certifications by attending the two-day conference briefings. If you are interested in earning credit hours, please email Infiltrate[at]immunityinc[dot]com in advance. 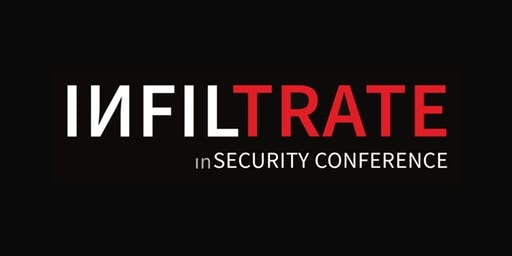 There are three pricing tiers available for INFILTRATE 2019. The first two tiers are quantity restricted. If you are interested in signing up for an Immunity Training Course and the Conference Briefings pass, a bundle discount is available. You will first need to buy your training ticket and then you are provided a one-time discount code via your confirmation email to purchase the conference briefings pass at the reduced rate of $1000. If you buy your conference briefings pass first, the discount code will not be sent. If you are looking to send a group to the training and/or conference briefings, please email us at infiltrate[at]immunityinc[dot]com for potential discount options. If you would like to purchase a no alcohol/no open bar conference briefings ticket at a reduced price, please email us at infiltrate[at]immunityinc[dot]com for more information. The U.S. Defense Information Systems Agency now has a role in the cyber domain as a network defender, which creates a formal relationship between DISA, U.S. Cyber Command, and the command's military service components. The matrix of participating organizations involved in this overall effort will convene at the AFCEA Defensive Cyber Operations Symposium to continue efforts on adapting technical solutions and enterprise management to improve efficiency, security, and reliability. The HackMiami 2019 Hackers Conference seeks to bring together the brightest minds within the information security industry and the digital underground. This conference will showcase cutting-edge tools, techniques, and methodologies that are at the forefront of the global threatscape. The conference features a jam-packed schedule of tracks that will appeal to both novice hackers and seasoned professionals. Here is a sample video of our past conferences. Since 1980, the IEEE Symposium on Security and Privacy has been the premier forum for presenting developments in computer security and electronic privacy, and for bringing together researchers and practitioners in the field. The 2019 Symposium will mark the 40th annual meeting of this flagship conference. The Symposium will be held on May 20-22, 2019, and the Security and Privacy Workshops will be held on May 23, 2019. Both events will be in San Francisco, CA at the Hyatt Regency. 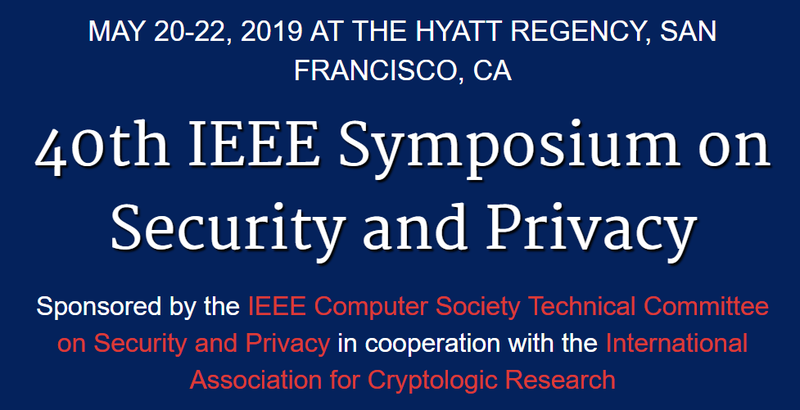 In cooperation with the Symposium, the GREPSEC Workshop will be held the prior weekend, May 18-19, 2019 in San Francisco. This pre-event workshop is for women and underrepresented groups interested in computer security research, and has a separate application and registration process, accessible through its website. Data capture, storage, and usage continues to grow at exponential rates. As a result, and in an effort to obtain operational efficiencies, many new organizations are “born in the cloud”, while for others, the migration of data and data driven business processes to cloud environments continues to escalate rapidly. The use of third party database and related cloud service offerings to support cloud and hybrid environments is also growing and evolving. However, security teams consistently report concerns with respect to the lack visibility and oversight of their data in the cloud. Typical questions being asked by CISOs are complex and not easy to answer. Join Imperva and (ISC)2 on May 23, 2019 at 1:00PM Eastern for an examination of these questions and how to address them effectively. CircleCityCon is about the community. Our signature offering is the community led training classes offered to all participants. Events and contests are organized by members of the security community, including both CircleCityCon staffers and community partners. Three tracks, incredible entertainment, and technical villages help round out the CircleCityCom experience. Of course, don’t forget the chance to meet and talk with your peers about all topics including security, hacking, and the latest superhero movies. If you’d like to see what past year’s sites looked like, feel free to visit the archives page. Find out how you can shift organizational culture to improve cybersecurity, privacy and business resilience at Gartner Security & Risk Management Summit 2019. You’ll learn leadership and communication skills to get business leaders on board making security and risk enterprise wide priorities. This is the year’s most valuable information update and networking opportunity for CISOs and security, risk and resilience professionals. Get a comprehensive update on cybersecurity threats and solutions. Hear new best practices for cloud security, AI, IoT, blockchain, DevOps and other challenges. Advance your IT security and risk strategy to support digital business. Join us to craft your security and risk plan to improve resilience, accelerate innovation and drive business growth with the entire organization behind you. DEF CON started back in 1993, originally intended as a party for members of "Platinum Net," a Fido protocol-based hacking network out of Canada. DEF CON has evolved into a much larger, more prominent event for information security professionals, attended by hackers, cryptographers, lawyers, law enforcement agents, and a variety of professionals representing a range of disciplines. Provides hands-on offensive and defensive skill-building opportunities. These courses are taught by some of the most sought-after international industry & subject matter experts, with the goal of defining and defending tomorrow's InfoSec landscape. The USENIX Security Symposium brings together researchers, practitioners, system administrators, programmers, and anyone interested in the latest advances in the security and privacy of computer systems and networks. USENIX is the first technical membership association offering open access to research, with a variety of events covering sysadmin, security, systems, and more. SecTor has built a reputation of bringing together experts from around the world to share their latest research and techniques involving underground threats and corporate defences. The conference provides an unmatched opportunity for IT Security Professionals, Managers and Executives to connect with their peers and learn from their mentors. Though we like to have fun and play-act like the pirates in, “Pirates of the Caribbean,” or the “Dread pirate Roberts” in “The Princess Bride,” in reality piracy has been troublesome and deadly since the dawn of civilization. Traveling the Roman roads in sandals with a donkey laden with your leatherworks, spices and tin? Pirates can waylay you and take it. Sailing on the seas with a ship full of tapestries, silver and horses from the newly re-discovered Americas? Pirates can board the ship and, and claim the goods. Even large ships that ply the seas with shipping containers full of cars, flat screen TVs and microcircuit components from all over the world hire private security firms toting AR-15s and 50 caliber rifles to fend off pirates in the seas of the 21st Century. Only one donkey now and then? One Ship? Those were the good ol’ days, because now one pirate, or the group he represents, can cause a billion-dollar data breach, take down an entire municipal government with well-placed ransomware, or weaponize narrow AI to conduct hacking campaigns that do more damage in minutes than a group of the smartest hackers could have done in years. It is time to learn to think like a pirate to fight the pirates! Arrrrr mates, come t’ Hacker Halted 2019 and learn th’ ways o’ the Pirate! Case studies on how leading enterprises leverage CASB to secure their cloud footprint. Marc Andreessen famously said, “Software is eating the world”, but what about in InfoSec? In the beginning, security practitioners depended on Excel and VB scripts to make sense of their data. Today, machine learning is aiding in the discovery and reporting of insights. As more and more cloud-forward companies are embracing an “infrastructure-as-code” model, what does this mean for the security leaders of tomorrow? Is automation important to your role and to the organization’s infosecurity posture? If so, join DomainTools and (ISC)2 on April 11, 2019 at 1:00PM for a discussion on security automation and how being fluent with programming languages and scripting can expand your knowledge and value to an organization, as well as strategizing for machines to work in harmony with the compliance and risk teams.